Did David Suzuki prevaricate about PCBs in farmed salmon? And if so, WHY? at the David Suzuki Foundation begin with good science." This post is based on a paper that I wrote in 2010, titled Research on Contaminants in Farmed Salmon: Science or Marketing? A shorter version was published in The Financial Post David Suzuki's Fish Story. Canada has the largest coastline in the world and we're right next door to the world's largest seafood market: the United States. If there's one industry that Canada should be developing, it's aquaculture. Northern B.C. and Nova Scotia, the places where fish farming could provide hundreds of jobs, are some of the poorest parts of Canada. Aquaculture avoids the worst risks of commercial fishing, such as over-fishing and by-catch. Yet, ironically, the biggest obstacle facing the aquaculture industry is opposition from environmentalists. In British Columbia, a "war on fish farmers" has been declared. More than 20,000 people signed a petition to close salmon farms. "Don't buy farmed salmon ANYWHERE. Phone your local hospitals and find out if farmed salmon is served to patients," says a brochure from the David Suzuki Foundation. "Its poison!" David Suzuki told a conference in Toronto. He wouldn't feed farmed salmon to a child, he said. In Australia, David Suzuki told an audience that farmed salmon is "full of toxic chemicals." A few years ago, Global Assessment of Organic Contaminants in Farmed Salmon, a study by Ronald Hites et al., triggered a worldwide scare about contaminants in farmed salmon. The Hites study found that levels of polychlorinated biphenyls (PCBs) were eight-fold higher in farmed Atlantic salmon than in Pacific salmon. If the eight-fold difference had been between 0.5 parts per million (ppm) and 4.0 ppm, the ﬁndings would have been consequential to human health. However, the eight-fold difference was between 0.0366 ppm and 0.0048 ppm. Since the tolerable level for PCBs in fish is 2.0 ppm, the eight-fold difference is inconsequential. Nonetheless, in a newswire that dismayed scientists, the American Association for the Advancement of Science (AAAS) reported “Farmed Salmon More Toxic Than Wild.” Following suit, the media reported the Hites study with alarming headlines worldwide. In the wake of the Hites study and its international publicity by environmental organizations, bad press about farmed salmon tripled for about two years, according to an an Idaho University study. Ninety percent of the news items mentioned cancer risks and yet the actual research findings didn't indicate any such risks whatsoever. 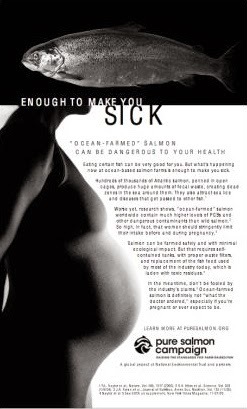 Pure Salmon NY Ad PCBsMuch to the chagrin of the public health community, in publicizing the Hites study, environmental organizations - including the David Suzuki Foundation - explicitly targeted pregnant women with the flawed message that farmed salmon should be avoided because of PCBs. The poster shown at the left is by the Pure Salmon Campaign of which the David Suzuki Foundation was a member. The Hites study was a follow-up to a study from the David Suzuki Foundation in 2002. Even before that study was published, David Suzuki sent a form letter to thousands of supporters - including the author of this blog. David Suzuki's letter began, “This may be one of the most unusual ‘Thank you’ letters you’ve ever received, but here goes. I want to say thank you for helping me to uncover the fact that B.C. farmed salmon is heavily contaminated with PCBs and other toxins." "I really do mean Thank You,” wrote David Suzuki. The problem is, David Suzuki didn't uncover the "fact" that he said he did. His study only had eight fish. Mercury levels were actually higher in the wild salmon than in the farmed but that's meaningless because such a small study isn't representative of either farmed or wild salmon. This raises what I believe is a fair question: why did David Suzuki falsely report that he had uncovered the "fact" that B.C. farmed salmon is heavily contaminated with PCBs and other toxins? Was this an honest error? Or did David Suzuki prevaricate about PCBs in farmed salmon? And if so, why? The Suzuki study came on the heels of market research by SeaWeb, conducted in the spring of 2001. A few months later, Pew made the first of several grants for the Hites study and on the very same day, Pew granted $181,000 to the David Suzuki Foundation. David Suzuki's research about contaminants in farmed salmon was funded by the Lazar Foundation, a pro-Alaskan foundation based in Portland, Oregon. 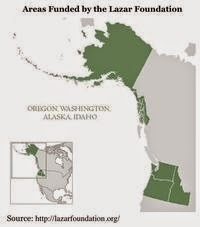 And yet, the Lazar Foundation says that it is focused on Washington, Oregon, Idaho and Alaska - not British Columbia. Lazar also explicitly states that it does not fund work on "toxics" so why did the Lazar Foundation pay for a study of contaminants in farmed salmon? Lazar also paid the David Suzuki Foundation $12,500 for "legal action challenging the expansion" of salmon farming in B.C. Lazar also funded market research by SeaWeb about farmed vs. wild salmon. SeaWeb's market research found that the most compelling reason why people might avoid a certain ﬁsh is fear of contaminants. Sadly, the least important factor was whether the species is over-ﬁshed. SeaWeb and Environmental Defense have been saying that the maximum number of safe meals of farmed salmon is half a meal per month for adults and older children and for younger children, zero meals. Who’s going to feed their child half a meal because half is safe and half isn’t? "The avoidance of modest fish consumption due to confusion regarding risks and benefits could result in thousands of deaths every year due to cardiovascular disease, and the suboptimal neurodevelopment in young children," Harvard scientists warn. At the University of British Columbia, scientists found that Vancouver-born infants of well-educated mothers are deficient in omega-3 fatty acids. The infants' eyesight was compromised, their brain development may have been adversely affected. This situation is not helped by the fact that Canada's most trusted environmentalist has been giving pregnant women faulty advice to avoid farmed salmon. The truth is, farmed salmon is higher in omega-3 fatty acids and lower in mercury than any other fish. The Packard foundation paid the David Suzuki Foundation $762,600 for Pacific Salmon Forests, a project which produced a brochure titled, "Why You Shouldn't Eat Farmed Salmon." In a series of open letters since 2007, David Suzuki has been asked whether the bad press that his foundation has generated about salmon farming is part of a "demarketing" campaign to prop up demand for Alaskan salmon. He hasn't replied but 23 press releases and negative articles about farmed salmon were quietly removed from his foundation's web-site. Nevertheless, the campaign against farmed salmon rages on. In 2010, the Moore foundation paid the David Suzuki Foundation $329,525 for "salmon market standards" and in November of 2012, Moore granted a further $496,850. The problem is, Mr. Carpenter’s claims are way out of line with the actual ﬁndings of the Hites study. Furthermore, Agriculture Canada, the U.S. Institute of Medicine and the U.K. authorities advise eating salmon - farmed or wild - on a weekly basis. "There are no consistent differences between wild and farmed fish both in terms of safety and nutritional contribution," says the European Food Safety Authority. 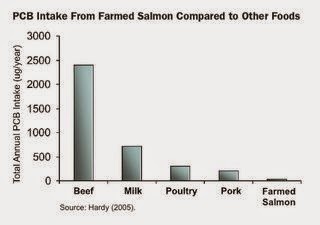 At Idaho University, Dr. Ronald Hardy estimated that the average yearly PCB intake is about 30 ug from farmed salmon, 200 ug from pork, 300 ug from poultry, 700 ug from milk, and 2,400 ug from beef. 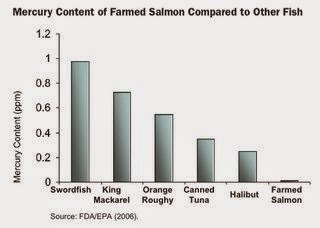 Evidently, farmed salmon is not a signiﬁcant source of PCB exposure compared to other foods. Dr. Hardy concluded, “Even if Americans doubled their intake of farmed salmon, the contribution of this consumption on total yearly PCB intake would still be 40–80 times less than the amount from beef. The Hites study was published in the prestigious journal SCIENCE, the flagship of the AAAS. At the time, the Editor-in-Chief of SCIENCE was Donald Kennedy, a former president of Stanford University, and a trustee of the David and Lucile Packard Foundation. The current Editor-in-Chief of SCIENCE, Bruce Alberts, is a trustee of the Gordon and Betty Moore Foundation. Since 2000, Packard and Moore have granted more than $130-million to B.C. organizations, none of them favourable to salmon farming. Of that, at least, $12-million went to the members of the Coastal Alliance for Aquaculture Reform which runs a demarketing campaign called Farmed and Dangerous. This campaign against farmed salmon is based on research about PCBs and sea lice (Krkosek et al. 2007), conveniently published in the journal SCIENCE while the Editor-in-Chief of SCIENCE was a Packard trustee. Packard has paid a staggering $83 million since 2000 for various projects to sway market share towards wild fish and away from the competition: imported, farmed fish. The Marine Sciences web-portal of the AAAS has been funded by Packard. The Hites study and its publicity was paid for with $5.5-million from the Pew Charitable Trusts; $2.5 million was granted to the State University of New York and $2.5 million to the Tides Center, part of the Tides USA network. Pew also granted $140,000 to Mr. Carpenter and $300,000 to Daniel Pauly at the University of British Columbia. For a study of its kind, a $5.5 million budget was unusual. The $440,000 for publicity was highly unusual. As per Pew's specifications, the Hites study compared farmed Atlantic salmon and wild Paciﬁc salmon. Because wild Atlantic salmon and farmed Paciﬁc salmon were excluded, comparisons among the same species of salmon were avoided. In essence, the study compared apples to oranges. Had the Hites study compared wild vs. farmed Atlantic salmon, or wild vs. farmed Pacific king ("chinook") salmon, it would likely have found higher levels of contaminants in the wild fish, a conclusion precisely the opposite of what was spread around the world in scary headlines. The Pew Charitable Trusts states that it holds itself to the highest standards of integrity, transparency and effectiveness. And yet, when asked how the Tides spent that $2.5 million, Pew staff refused to say, citing the advice of its legal department. 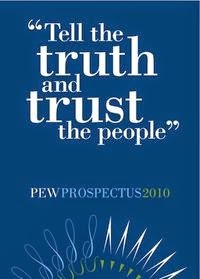 "Tell the truth," says the front cover of Pew's annual report for 2010. That same year, I appealed to the Pew Charitable Trusts, in an open letter, to please clear up the confusion and controversy stemming from flagrantly unsubstantiated claims about PCBs in farmed salmon, made by Pew-funded scientists on the basis of Pew's $5.5 million dollar study. The CEO of the Pew Charitable Trusts replied indifferently, "it is important to note that this research is rigorously peer-reviewed and published in prestigious journals such as SCIENCE. It was therefore hard to understand the claim in your open letter that the findings are "flagrantly unsubstantiated." Too hard to admit maybe, but surely the CEO of a $4.5 billion dollar foundation should know when a food contains merely 3 percent of the acceptable level of an omnipresent contaminant like PCBs, there is no basis to say that that particular food should be avoided because of PCBs. In the London Times, Magnus Linklater called the Hites study “a sorry saga of ﬂawed science, selective research and hidden commercial bias." "That it was allowed into the pages of the apparently respectable journal SCIENCE is inexplicable,”wrote Linklater. Facing stiff competition from farmed salmon, the value of Alaskan salmon collapsed over the 1990s from a peak of $1.2-billion to only $125-million. Since 2002, Alaskan salmon prices have tripled. This remarkable improvement was due in part to Alaska's $50 million Salmon Revitalization program. However, much of that money went to 2,600 fishers and 63 municipalities. That won't have done much to improve salmon prices. After Alaskan salmon prices improved, the Alaska Seafood Marketing Institute reported, "The infusion of dollars wasn't the sole driver; we need to be honest here. It wasn't the only thing that changed market conditions. There was some bad press for farmed salmon and there was the health issue and people wanting more seafood in their diets. All these things kind of came together like the perfect storm." On the day before the Hites study was actually published, press releases were issued by a trio of Packard-funded environmental organizations, including SeaWeb, Environmental Defense and the David Suzuki Foundation. SeaWeb calls wild salmon "the white truffle of seafood" and has a long history of promoting Alaskan salmon. 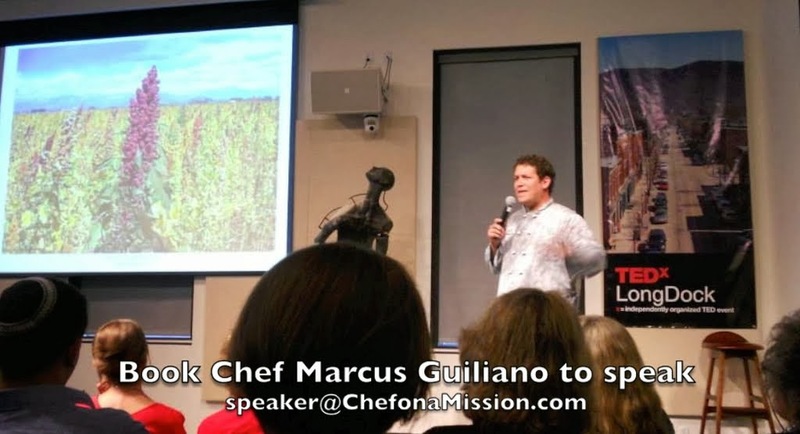 Environmental Defense provides recipes for Alaskan salmon. Since 2000, SeaWeb and Environmental Defense have been paid $23-million and $21-million, respectively, by the Packard foundation. SeaWeb was also paid by the Moore Foundation to co-ordinate an "antifarming campaign," including "science messages" and "earned media." After questions were raised about this grant, it was quietly re-written by the Moore Foundation, along with three other grants for a total of $3.6 million for the "antifarming campaign." In my first letter to David Suzuki, back in April of 2007, I concluded by asking Dr. Suzuki a series of questions about his foundation's involvement in the U.S.-funded "antifarming campaign" against farmed salmon. I asked Dr. Suzuki (see page 25) whether his foundation is or was one of the "antifarming ENGOs" and whether it participated in the "standardization of messaging" and the "co-ordination of media" through SeaWeb, based in Maryland. Dr. Suzuki did not answer my question but several months later, I discovered that a document which shows that, in fact, the sea lice researchers that the David Suzuki Foundation funded at the University of Alberta had a "research partnership" with SeaWeb. Not only the Moore Foundation funded SeaWeb for an "antifarming campaign" involving "science messages," Moore also funded the sea lice research itself. This another information ultimately led me to file a formal complaint of apparent scientific misconduct with the University of Alberta about the sea lice controversy that brought the salmon farming industry to its knees. For more about my complaint of apparent scientific misconduct, please click here. The Best Way To Avoid Farmed Salmon in a Restaurant. Why Farmed Salmon? Why does anyone eat farmed salmon? Why does anyone eat farmed salmon? Drug resistance in sea lice: a threat to salmonid aquaculture. Sea lice are copepod ectoparasites with vast reproductive potential and affect a wide variety of fish species. The number of parasites causing morbidity is proportional to fish size. Natural low host density restricts massive parasite dispersal. However, expanded salmon farming has shifted the conditions in favor of the parasite. Salmon farms are often situated near wild salmonid migrating routes, with smolts being particularly vulnerable to sea lice infestation. In order to protect both farmed and wild salmonids passing or residing in the proximity of the farms, several measures are taken. Medicinal treatment of farmed fish has been the most predictable and efficacious, leading to extensive use of the available compounds. This has resulted in drug-resistant parasites occurring on farmed and possibly wild salmonids. A conservation group is criticizing federal and provincial agencies for not publicizing a preliminary test showing the presence of a potentially deadly salmon virus at a New Brunswick aquaculture operation. 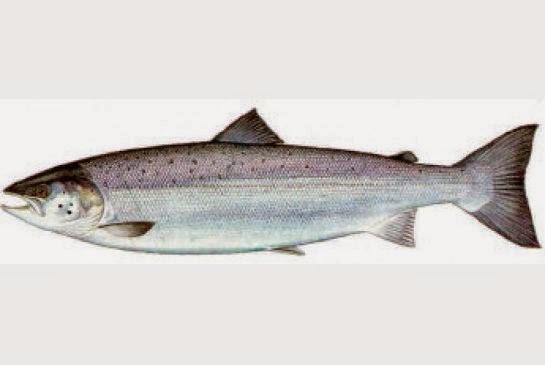 The Atlantic Salmon Federation says it heard on Monday that a strain of infectious salmon anemia was reported by an aquaculture company located along the Bay of Fundy. The virus can be fatal to fish but doesn’t cause harm to human health. Jonathan Carr, the federation’s director of research, says he went to the Canadian Food Inspection Agency (CFIA) website but didn’t find a report of the incident. “Without the public knowing what’s going on, a lot of rumours and wildfires can happen,” he said in an interview. A spokeswoman for the New Brunswick government said in an email there was a suspected case of virulent infectious salmon anemia detected last month. Pam Parker, director of the Atlantic Canada Fish Farmers Association, an industry group, said in a telephone interview that in March a fish in one cage in a New Brunswick salmon farm was found to be positive for infectious salmon anemia during a preliminary test. She said the company didn’t wait for a confirmation of a final diagnosis by the CFIA and proceeded to remove all of the fish from the pen and notified the provincial and federal regulators of their actions. Parker said other salmon farmers in the area were notified and the affected farm is in quarantine. She said she didn’t know the name of the affected salmon farm. The CFIA was asked for comment Wednesday but did not provide any. Carr said he’s glad that the affected fish were killed quickly after the outbreak but he feels more information should have been released after the preliminary tests. Parker said the regulations and the process are rigorous.